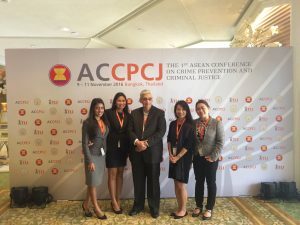 In an effort to better understand ASEAN’s effort to fight common crimes in the region, Sharmee attended the first ever ‘ASEAN Conference on Crime Prevention and Criminal Justice’ from 9 to 11 November 2016 in Bangkok, Thailand. 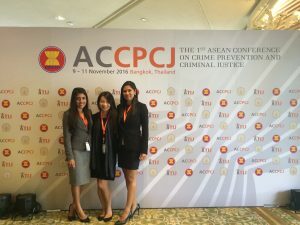 The conference was intended to be a “regional platform that promotes and enhances crime prevention and criminal justice institutions through an evidence-based policy dialogue with multiple stakeholders” (http://www.tijforum-accpcj.org/index.php). 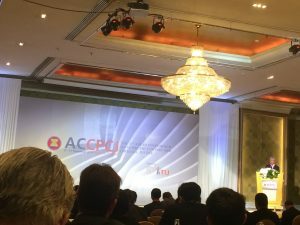 Some of the key speakers at the conference include Thailand’s Minister of Justice, Secretary General of the ASEAN Inter-Parliamentary Assembly, Datuk Dr Chiam Heng Keng, a psychologist who focuses on children’s rights. Throughout the conference, there was huge emphasis placed on the importance of regional cooperation in preventing crimes and ways in which regional frameworks and institutions can be established to collectively tackle crimes. Sharmee was also able to gain insights into crime patterns in the region. This ties in with the work she does since human traffickers rely a lot on regional level networks for their operations.